This is a little sketch I made just for this lesson. Everything in the sketch seems normal in the sense that space appears to be presented realistically. To accomplish this kind of drawing, there are just a few principals you must understand. We all understand the principal of parallelism. It applies to the real world, but its very different for perspective drawings. All parallel lines in the real world converge in a perspective drawing. That is the unbreakable rule. All parallel lines converge at one point. If your drawing ever looks wrong, its because you have one group of parallel lines converging at one point, and other lines, parallel to the first group, converging on a different point. A vanishing point is that point where all parallel lines converge. The vanishing point is the key to understanding the whole subject of perspective. All parallel lines converge at a single "vanishing point". Lets see how that works: We are dealing here, with three sets of lines. One set is the furrows in the field. The second is the left "face" of the barn. The third is the right "face" of the barn. The furrows are all parallel lines, and all the furrows meet at the same point. The left face of the barn has many horizontal lines. ( For instance, the foundation line, where the wall meets the ground). These horizontal lines all meet the the same point. Since the furrows are ploughed parallel with the barn, both the furrows and the side of the barn are parallel. Different planes, but still parallel. Therefore, they all meet in the same exact point. The horizontal lines contained on the right "face of the barn" also meet at a single point. Its a different point, because they are not parallel with the first group. Nevertheless, because all of these lines are horizontal, (parallel with the ground), they all meet on the "visual horizon" ( which, in this case, is the end of the ground ). All horizontal lines converge on the "visual horizon". All parallel lines meet at the same point. This point is called the vanishing point. There can be may vanishing points. All of the horizontal lines will go to vanishing points on the horizon. 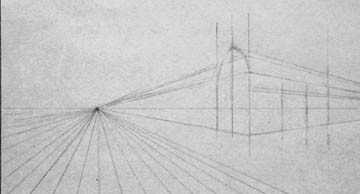 The vanishing points of all horizontal lines lie on the "visual horizon". Notice how the beginning of each furrow is equidistant. This neat little trick works for a lot of different circumstances. Its worth remembering. You will understand it well if you do the following exercise. From here on this page is under construction. It will be done in a few days. We need to understand a little more about the horizon. How does this apply to arcs and circles? Keep painting .Please feel free to link to this page. Principal 1) The visual horizon. There is always a line which represents our visual horizon. It is usually, (but not always, horizontal). Everything here is copywrited and may not be copied in any form without my permission .I would love to get some feedback on these lessons. Are they clear? Is it what you want? How's my spelling? English? Syntax? You can e mail me , or use the guestbook. Thanks.